Multi-award-winning Professor Noggin’s games help children learn and communicate while having fun. Other titles include Explorers, History of the United States and Countries of the World (best-selling title). “We’ve been doing very well also with Professor Noggin’ by Outset Media,” said Mary Walsh, owner of Greenfield, Mass.’s Magical Child. Launch Date: July 2006. 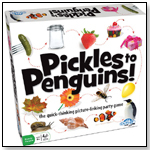 Pickles to Penguins is the quick-thinking picture-linking party game! Don't fret if the party gets frantic - the guests are probably just having a blast playing Pickles to Penguins - the frantic party game where you link the pictures to win. Get rid of your cards the quickest by figuring out what your cards and the cards in play have in common. Do they share a colour? Are they both things you find in a salad or bring to a party? Exercise your lateral thinking abilities, but don’t be too hasty or you may have to pick up penalty cards for stretching a connection too far. Take a deep breath and let the chaos begin! Hundreds of pictures, but how many can you link together? Four intense categories are waiting to work out your brain from all angles at once - Brain Bending Conundrums, IQ Squares, Picture Problems, and Word Mixers. Challenge your friends and see who's the smartest! 486 puzzles, mysteries, conundrums and trick questions. Includes puzzles, mysteries to solve, conundrums & trick questions. Ideal for building problem solving, visual spatial skills & creativity. This always changing, ever rearranging crossword game has 60 more tiles than the original and comes in a tile storage bag for travel. Players draw letter tiles and build their own personal crosswords as fast as they can. Whenever players use all their letters they yell, "Pick two" and everyone draws more tiles, which must then be added to their crosswords. Letters and words can be re-arranged, allowing players to use up their tiles. Now aspiring artists can create their own puzzles. These blank puzzles are made with high-quality board and are sturdy enough for paints. There are 3 additional sizes of Create Your Own Puzzles as well as the option of pencil crayons. The kit comes with 2 puzzles and a set of crayons. Create Your Own Puzzle makes a great gift for any age. Launch date: 2010. From Cobble Hill. — In a Summer 2012 survey, two out of 12 retailers told TDmonthly that Cobble Hill (dist. 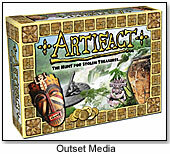 by Outset Media) was a best selling brand of puzzles. Kids can learn to appreciate the highest achievements of civilization in painting, sculpture and architecture. This product is designed to cover the world of art across time and culture, introducing children to basic terminology and famous artists. The Professor Noggin series has won more than 12 awards. Launch date: July 30, 2009. The game has two levels of difficulty for kids of all ages. Kids will hone their communication skills while learning about monkeys, rubber plants, jaguars and more, as Professor Noggin takes them from the forest floors of Africa to the canopies of the Amazon Basin. The material covers both tropical and temperate rainforests. Launch date: June 2008. The game has two levels of difficulty for kids of all ages. Kids will hone their communication skills while learning about extraordinary women in the field of science, art, politics and more. Launch date: June 2008. This musical game contains a collection of more than 1,000 songs from artists ranging from Prince to Queen to ZZ Top. Players must hum tunes for other players to guess. The game includes 200 cards, a game board, a sand timer and an instruction booklet. Launch date: 2008. This game of who-said-what asks players to write responses to funny questions and situations, and then asks everyone to guess who wrote what. The game is intended for five or more players and includes 162 cards, twelve pencils, an answer sheet pad, a scoring pad and a scoring sheet shield. Launch date: 2008. In this game, players guess what their teammates will associate with various words and pictures, and try to match answers. Players only have 30 seconds to come up with matching words, so the game is a race against time and other players. A trilingual edition in English, French and Spanish is also available. This product is a National Parenting Center Seal of Approval Award, Canadian Toy Testing Council Best Bet Award and 2004 Games Magazine Games 100 Award winner. Launch date: 2008. Multi-award-winning “Professor Noggin’s” games help children learn and communicate while having fun. 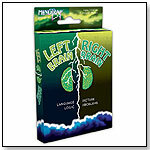 Players collect 30 large, sturdy, illustrated cards by correctly answering knowledge-based questions. Game play challenges memorization skills. A special three-numbered die creates interaction and determines which question is asked, while Noggin’s Choice turns allow players to take cards from their opponents. There are two levels of difficulty for children of different ages and abilities. There are 30 titles, including The Human Body (10437), Explorers (10440), History of the United States (10439), and Geography of the United States (10438). Avast ye mateys! Here’s a salty, shiver-me-timbers strategy game. Young scallywags are marooned on a tropical island with a piece of treasure map. By hook or by crook, (or by roll of the Jolly Roger die) players face challenges such as scurvy ne’er-do-wells and dangerous animals. Precious gems and landmarks discovered along the way help players reach the treasure first. A unique tile game board means no two games are ever alike... and players can move the tiles to thwart opponents. This product received a 2007 Mensa Select award, a 2007 National Parenting Center Seal of Approval and a spring 2007 Parents' Choice Award. Multi-award-winning Professor Noggin’s games help children learn and communicate while having fun. Players collect 30 sturdy, illustrated cards by correctly answering knowledge-based questions. Game play challenges memorization skills. A special three-numbered die creates interactive play, while Noggin’s Choice turns allow players to take cards from their opponents. There are two levels of difficulty for children of different ages and abilities. There also are now 30 titles — one for every interest. It’s great for travel and waiting in airports. 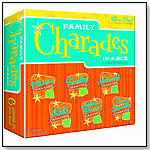 The games fit in a suitcase or glove compartment. Any kid who’s ever wanted to just play games rather than study for history or geography testscan now do both at the same time. Designed specifically for younger players, American Trivia: Junior Edition allows youth to have a blast, challenging each other’s knowledge on 100% American content. The game is easy to learn, with 1080+ questions in geography, history and general categories. In a world where knowledge is power, kids can now get their educations in the most entertaining way, by playing American Trivia: Junior Edition. Rhyme Thyme is a fast-action matching game for 2 to 5 players that will have kids racing to get rid of their cards first. When players spot a rhyme in another player's hand, they race to be the first to call out the match. Players need keen eyes and fast hands to "catch the match" in this game. Rhyme Thyme helps children develop their hand-eye coordination, word recognition and reading vocabulary skills. It includes an instruction booklet and 108 illustrated cards. Pick Two Deluxe is the always-changing, ever-rearranging crossword game. Players draw letter tiles, building their own personal crosswords as fast as they can. Whenever players use all their tiles, they yell PICK TWO and everyone draws two more tiles, which now must be added to your crossword. The best part is that you can always rearrange letters or even words to use up your tiles! It won The National Parenting Center 2005 Seal of Approval, Oppenheim Toy Portfolio Gold Seal and iParenting Media Award. History and cultures collide in this hunt for stolen treasures. Artifact is an exciting strategy game that sends players around the world to recover missing artifacts. From Armenia to New Zealand, players trade cards, take challenges and assemble teams to retrieve 24 historical works of art. The perfect blend of strategy, luck and negotiation skills will lead players to discover the amazing world of Artifact.